This is a copy of the OLD project page. New project home and the japanese translated page are here. PHPlot is a PHP4 class for on the fly graphs generation. It was started by Afan Ottenheimer in 2000 as an opensource project, and is now co-developed with Miguel de Benito thanks to sourceforge. It is distributed under the terms of the GNU General Public License, and the PHP license. You can always obtain the latest source from the sourceforge project page, please do also check CVS, we try to have it always working there. Example line graph with labels, legend and left and lower axis titles. Several different graph types: lines, bars, points, areas, pie, squared. text-data, data only and data-error data types accepted. 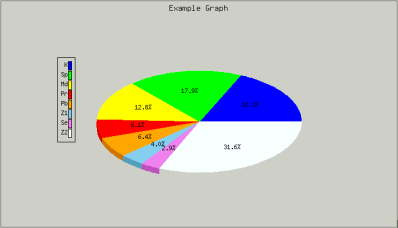 3D shading for pie and bar graphs. Different line types: solid and wholly customizable dashed ones. Can draw error margins along y-axis when supplied in data. Highly customizable canvas: titles, labels and ticks can be placed anywhere, with any color and everything gets automagically placed without overlapping. Legend. Different types on the works. Automatic placement of several plots in one image. Subclassing for optimisation: move features into subclasses for optional use and leave a fast core. We are not sure about exact requirements, but at least PHP 4.1.0 and GD Lib 2 are necessary. Feedback is welcome. You can rush for a quick start here. Example-o-matic. Create most of the plot types with all data types and tweak most of the parameters. NOTE:If the examples don't seem to work for you, it may be that you don't have PHP set up correctly. If you do you should see some bold text here: OK! If you see no text then you should contact your system administrator or your webserver documentation as to how to configure this. Original work by Afan Ottenheimer. Recent work by Miguel de Benito. Contributions by Thiemo Nagel, Marlin Viss and Remi Ricard.